Designed for just about any injury or illness imaginable, the Skin Illustrator FX Palette Liquids can simulate 1st, 2nd & 3rd. degree burns, cuts, scrapes, scabs, and bruises. The FX Palette seamlessly integrates with the FLESH TONE Palette to create varying degrees of injuries and illnesses. The pigment content is much higher than any other palette available so the colors go farther and last longer. Tested on feature film productions by a team of award winning makeup artists, FX has already proven itself a valuable addition to anyone’s makeup kit. BLOOD TONE was created specifically to aid the artist in the struggle of feature film continuity and syrup based bloods. It is a realistic natural blood color that can easily be altered to a deeper, more theatrical color blood with the addition of ULTRA BLUE. Conventional bloods will wear or flake away after your actor has left the chair, but with a stand alone application of BLOOD TONE plus a topical application of KY Jelly, your blood work will look good all day without rubbing off or staining the actors costume. When working with the BLOOD TONE, a thin application of KY provides a nice sheen, while a large dollop gives the appearance of dripping blood. The durability of the BLOOD TONE color allows you the freedom to place your blood in the morning, allow it to dry, and then instantly freshen it to camera-ready quality whenever your actor is actually called to set – even if it’s hours later. BLOOD TONE also works exceptionally well as an abrasion resistant under color with syrup based bloods. If the conventional blood washes or wears away in a wet scene, the BLOOD TONE will still be there. Either way – you’re covered! Mixing certain colors will not create similar tones, already present in the palette. Mixing the YELLOW and the BLUE will produce a different green than the GREEN that is in the palette. Use the BURNT ORANGE to provide a rust tone. The AGED BLOOD is a mid-ground aged blood which is not too blue or purple. By taking the AGED BLOOD and adding it to any other color in the palette, you will get a whole new range of color. Removal is easy with Telesis Super Solv orTelesis Makeup Remover. The colors available in the Flesh Tone Palette system range from the palest of pink tones to the deepest rich yellow tones. The system contains skin tone colors with warming/cooling adjusters that are ideal for fine tuning a skin tone mix that's a perfect match, or for creating a subtle bruising for close camera work. RICE PAPER, the staple of the palette, can be used as a white color to lighten a particular mix, or on its own to match the skin. You can use NATURAL 1 & 2 as the basis for most Caucasian tones. These colors already lean to the yellow side of a natural tone so you can decide how much warmth or coolness to add. If you need to warm the NATURALS, add a little CORAL ADJUSTER or ROSE ADJUSTER II. If you need to cool the tone, add a little OLIVE ADJUSTER I (liquids only) or VEIN TONE to achieve a beige color. LAO 1 & 2 will be the basis for your yellow undertoned subjects. Start with these colors and you can lighten the tone with a RICE PAPER mix. To make your color more beige, add VEIN TONE. To make your color more olive, add OLIVE ADJUSTER II, and if you want to add a touch of golden quality, use the CORAL ADJUSTER. CEDAR BROWN (a new color) is a warm yellow based brown that can add a tan to your actor or darken the 5 basic flesh tones, All of the color adjusters have been formulated to intermix with the flesh tones. 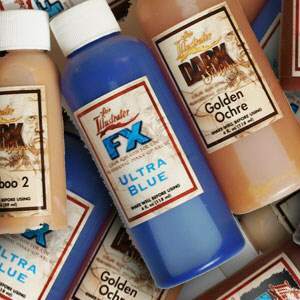 The Skin Illustrator Liquid Colors can be used with any airbrush. The third addition to the Skin Illustrator color system is the Dark Flesh Tone palette. Designed as the follow-up to the original Flesh Tone palette, the Dark colors complete the entire range of flesh tones. 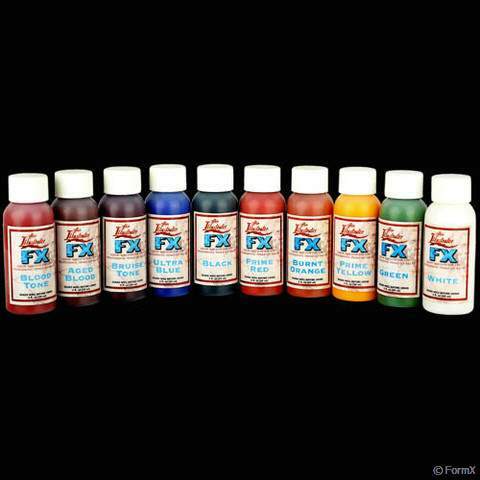 When combined with the FX and light Flesh Tone colors, the Dark Flesh Tone colors will allow the artist to duplicate virtually any skin tone, no matter how light or dark. The BAMBOO 1 and 2 colors are warmer yellow base tones than the LAO 1 and 2, offered in the original Flesh Tone palette. This significant difference gives the artist an even wider range of tone variation when blending colors. Other warm base tones include CHOCOLATE, ESPRESSO 1 and 2, and MIDNIGHT BROWN, the darkest of the base tones. BURNT SIENNA, GOLDEN OCHRE and RED OXIDE are all adjusting colors that alter the base tones in different ways, providing an endless array of color possibilities. By mixing MIDNIGHT BROWN with the BLACK tone from the FX Palette, the deepest ebony tones can be obtained, creating rich, natural colors that are not gray or ashy. When mixing MIDNIGHT BROWN with BAMBOO 1, you begin to create taupe colors, which are great for use as character shading colors. CORAL BLUE is a gentle wash-tone adjuster that will provide a cooling effect, different than the other blue tones found in the original Flesh Tone palette. The Dark Flesh Tone colors are also great for defining hairlines and filling in scalp patches. The CORAL BLUE and BURNT SIENNA are also fabulous for covering up beard shadow. The Complexion Palette is the fifth addition to the Skin Illustrator line. The palette was created to give artists a wider range of red tones and adjusting colors which allow the fine tuning of an appliance makeup or to help blend the appliance with the natural skin tones. The blue based reds can be used as-is, mixed together, intermixed with all Skin Illustrator colors or with other brand colors and palettes. They can also be adjusted into warmer ranges by using the Light Sienna and Warm Ochre adjusters. Pastel Yellow is a highlighter as well as a lightening tone. RedRum is a blood-like tone with less orange than the FX Palette's Blood Tone color. This allows the artist to put a blood-like flush in the face and body that can be colored to a variety of complexions. Cool Tone (fomerly Olive Adjuster) as well as bright tone favorites like DT Blush, round out a collection of colors that will make matching blush tones a breeze. The Complexion Palette is an excellent way to fine tune your makeups - a definite must for your makeup case! These colors are ideal for beauty, character and special effects make-up. This collection of colors is designed to simulate a variety of dirt, grime, and filth effects, and can be used to recreate the look of almost any dirty or soiled visage. THE GRUNGE palette unites Skin Illustrator colors that have been used separately for years. The colors have been created in collaboration with top artisans in the industry, and have been refined on various actors for the camera. Two of the colors, Soot and Powder, have been introduced with the tag "fumo," meaning, "smoke." They are designed to have a serendipitous smoke quality that can be built up into overlapping patterns. Laying down layers of Soot followed by streaks of Black from the "FX" palette will introduce layering effects that add more depth than using either color alone. Our DIRTWORKS POWDERS and DIRTWORKS GRIME SPRAYS are a coordinated system that are matched to the Skin Illustrator GRUNGE PALETTE. This unique collection of colorful pigments was designed for creating clowns, mimes, tattoos, and the psychedelic 60's and 70's. 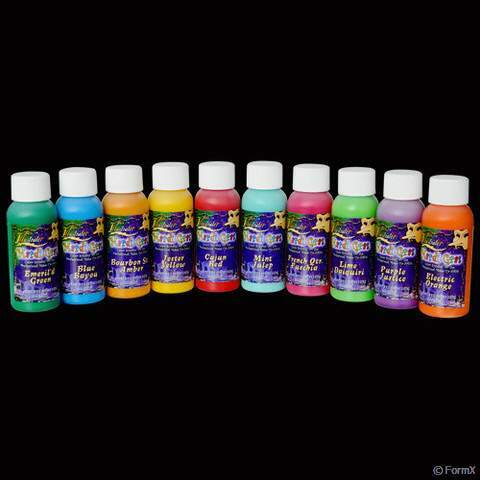 The bright exotic colors are perfect for carnival and festival body and face painting. The Mardi Gras Palette can be used with any other Skin Illustrator palette to create your own new colors and shades. The Skin Illustrator Necromania Palette Liquids are great for all things dead, Morgue dead, frozen dead, decaying dead, undead and almost dead. With the Necromania Palette, there's no dead end to the different stages you can create of the post-mortem persona.